Beverly Hills City Hall is located at 455 North Rexford Drive, Beverly Hills, CA 90210; phone: 310-285-1012. Photo: Karasik House, ca. 1960, 436 Spalding Drive, Beverly Hills, CA. Home designed by architect Lloyd Wright, son of Frank Lloyd Wright. Listed on the National Register of Historic Places in 2011. Photographed by user:Neuralstatic, 2014, (own work) [cc-by-3.0 (creativecommons.org/licenses/by/3.0)], via Wikimedia Commons, accessed November, 2014. City of Beverly Hills Community Development Department, City of Beverly Hills General Plan, 2010, www.beverlyhills.org, accessed December, 2014. 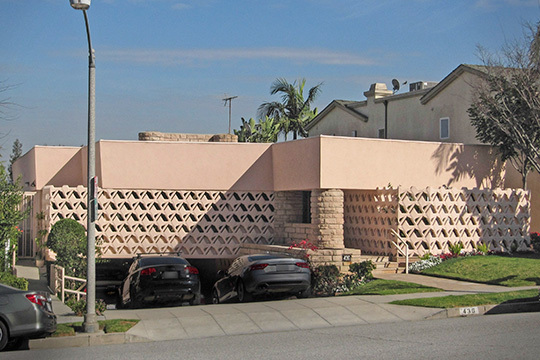 City of Beverly Hills Community Development Department, City Landmarks Assessment & Evaluation Report, 2014, www.beverlyhills.org, accessed December, 2014.